Okay, you know I use my rice cooker to cook some kinds of pasta, but when Cook’s Illustrated reviewed microwave pasta cookers and gave it a thumbs up, I had to try–I mean that should be even faster and easier than rice cooker, right? 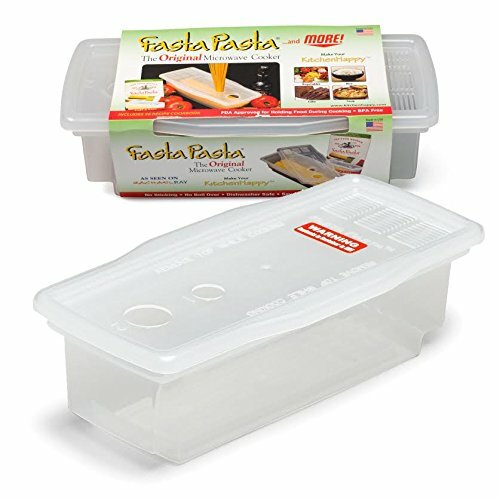 I ordered the Fasta Pasta Microwave Cooker. Delivered quickly, and needless to say, got tried out quickly. I’ve cooked both ravioli and capellini in it successfully. Cooking times are obviously going to vary with the power of the microwave, but generally the times given on the included card have been very accurate. It’s easy to move around as there are handles on both side. The drain slots in the lid did not let the capellini slip through. I’m really surprised–but I think that will be my method of choice for cooking pasta in the future.